I absolutely LOVE Jennifer L. Armentrout. Words cannot express how much I love JLA and her writing. I had the pleasure of meeting and interviewing her at BEA 2016, and she is a lovely person and a phenomenal author. No one can write romance like she can. Her characters are always realistic, and her pacing and plotting are just amazing. 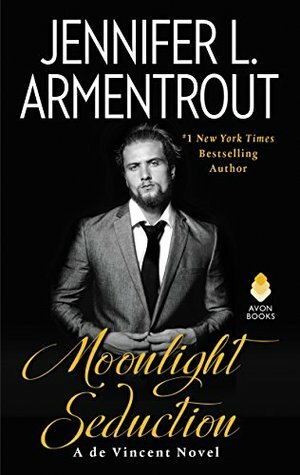 Moonlight Seduction is a beautiful, touching, and steamy romance. If you want a book that you can't put down with a strong female lead and a swoon-worthy bad boy, then this novel is for you. Nikki is one of my favorite female characters of all time. I'm a "helper," and an animal lover, and a bleeding heart, more or less, and it is so hard not to be a doormat. Then I feel bad because I refuse to be a doormat, but I just let myself feel guilty because it's better than being walked on. ANYWAY, because of this, I absolutely loved her character. She is a person who cares about the world around her, and she grows into someone who will protect herself, no matter what, and I had an immense amount of respect for her. I wish she was real so we could be friends. I'd also like my own Gabe, please. Yes, he's dark and somewhat broody and makes stupid mistakes, but he's good deep down, and he really does a lot for those he cares about. Seeing things from his perspective and Nikki's perspective really made me feel a connection to both of them. I also wish he was real, and would clone himself. I wouldn't steal him from Nikki because they are just beautiful together, so cloning it is. The plot made me not want to put this book down. Watching the characters grow and interact while also wondering who the worst of the bad guys were (let's face it, there are a lot of bad guys in these novels haha) made this book hard to put down. The pacing is spot on, and nothing feels rushed or too slow. Everything unraveled at the perfect time. There was one thing I didn't see coming, though I had the "bad guys" figured out, and it shocked me. The romance was super hot and steamy. There was nothing PG13 about this book, that's for sure. The writing was fantastic, of course. Overall, this is a fantastic, and hot, summer read. Give this book (and series) a try, if you haven't already. You won't be sorry.